This week's Grungy Monday Challenge #32 over at Studio L3 challenges us to use our favorite technique from Tim Holtz's 12 Tags of Christmas. This was quite difficult for me since there were so many wonderful techniques I learned and loved. I knew I wanted to make a birdhouse. That much was already in my head. I loved Tim's 12th tag where he layered stamping and tissue paper and Rock Candy distress Stickles to create a soft, vintage shabby look. 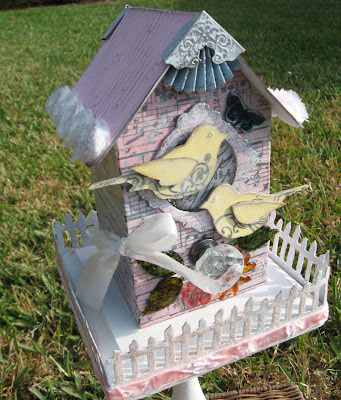 Perfect for my birdhouse! I have step-by-step photos and all the details that went into this project, but due to time constraints today will have to post those tomorrow. For now, I wanted to get the project up and linked to the Grungy Monday challenge. This week's challenge is sponsored by Simon Says Stamp, one of my favorite sites to order all Tim Holtz products from. They carry everything I need! Stay tuned for all the details on this project tomorrow. Enjoy your Saturday! Wow, what an amazing birdhouse! I gotta tell you how much I loved your card to Tim! Love that photo of the two of you and it so captures how much of a real guy Tim is when you meet him. He does not let any of his fame go to his head at all. Gotta love him! Beautiful!! Can't wait to see your next post on this. You are so talented Annette! A.mazing, Annette! Takes my breath away. Hi Annette, so glad to be leaving a comment to congratulate you on such a wonderful project. Your photo details are AMAZING and just love the fence and the roof (great finish). Thanks for sharing, just beautiful! Hugs across the miles, Lisa and Elaine @ Destination Art, Western Australia! Wow! This is wonderful and you have given me some fabby ideas for my birdhouse which is in my room still awaiting "doing"!! I shall have to come back to see your piccies! Congratulations on winning the Challenge - you truly deserve it! !